Vineyard weddings are a fantastic way for a couple to celebrate their nuptials. They offer DC-area fiancés the very best in outdoor marriage celebrations. The sun on the grapevines adds a magical glow to every image that their Washington, DC, wedding photographer produces. This is especially true in the late autumn, which is when we took this picture. The sunlight is less direct than it is in the summer, and its source dips below the horizon earlier. This means that a vineyard wedding is likely to be bathed in gentle, golden light at that time of year. The wedding featured here took place at one of the many vineyard wedding venues in Northern Virginia. That part of suburban Washington has many up-and-coming wineries that also host marriage celebrations. The bride and groom depicted in this photo chose Bluemont Vineyard for their nuptials. In our professional opinion, they made a great choice! Bluemont Vineyard is situated on a hill just outside Leesburg, Virginia and not far from the West Virginia border. Though it is on the outskirts of the DC metro area, it is still easily reachable from the city center. It is a lovely locale for an outdoor ceremony… and for taking great wedding pictures! Couples tying the knot there can exchange their vows with a stunning view of a bucolic valley as a backdrop. As we mentioned above, the surrounding hills and trees positively glow in the setting autumn sun. That makes photographs of a man and woman pledging their love to one another something truly special. As its name suggests, Bluemont Vineyard is also a working winery. Not surprisingly, the majority of its grounds is lined with lovely rows of grapevines. As DC wedding photographers, we find that those agricultural features make a great setting for couples portraits. One of the challenges of that part of wedding photography is getting some privacy for the newlyweds. There are lots of people who want to be around a couple on their wedding day. Their intentions are good, of course, but they can be a distraction at a time when we need the bride and groom alone. Rows of grapevines form a natural barrier that helps give the separation that is often needed for great couples portraiture. We can photograph brides and their grooms can take romantic strolls between the rows. Alternatively, we can take pictures of them enjoying a few minutes of peace during their otherwise hectic wedding day. The primary event spaces at Bluemont Vineyard are its main house and the lawn immediately behind it. Because the DC weather was so nice on their wedding day, this couple held their ceremony on the latter. They read their wedding vows amid the vibrant reds, yellows and browns of the fall leaves. They later celebrated having tied the knot with a raucous reception indoors. Their wedding ceremony was one of our favorite parts of the day to photograph. It was touching and heartfelt, and revealed the depth of their feeling for one another. 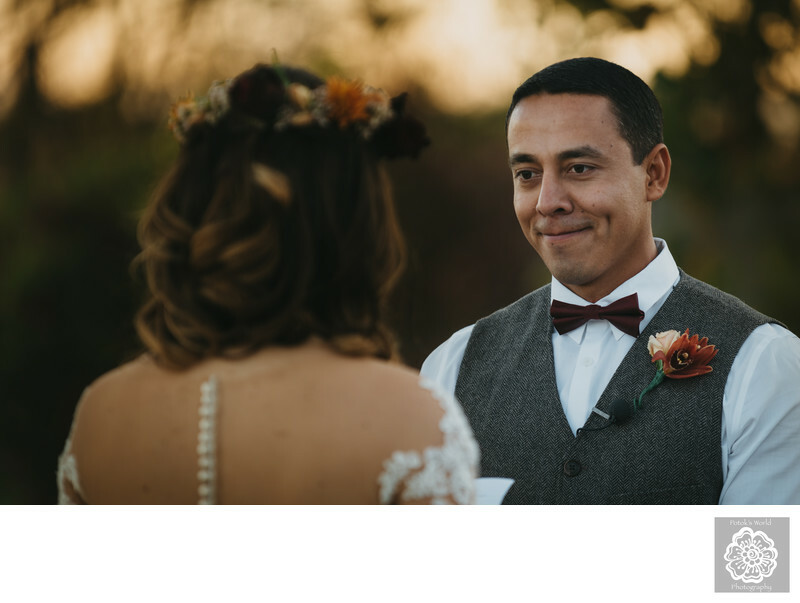 The groom’s vows to his future wife caused tears to roll down her cheeks. When it was her turn to speak of her love, the groom became similarly overcome by emotions. He also teared up as he looked at this woman who within minutes would become his wife. It was the sort of tender moment that DC wedding photographers like us live to capture on film. We took a variety of wide-angle and tightly-focused shots that the couple absolutely loved. Location: Bluemont Vineyard, 18755 Foggy Bottom Rd, Bluemont, VA 20135 .